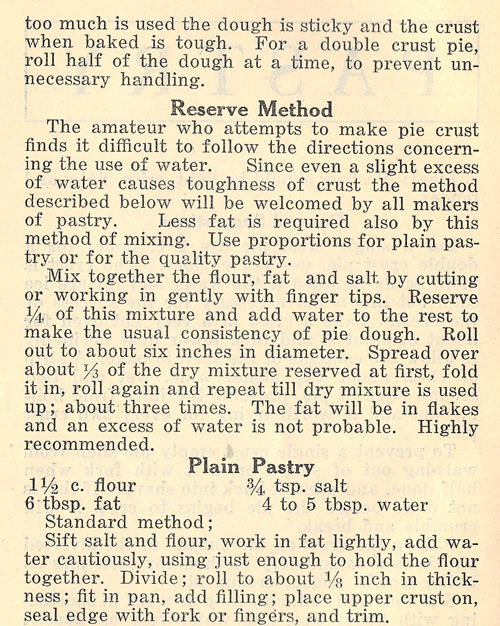 Many older cookbooks refer to oven temperatures as very slow, slow, moderte, hot, very hot, and extremely hot. 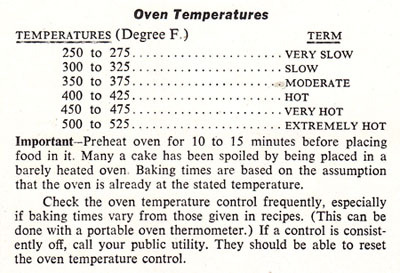 In my Encyclopedia of Cooking, Volume 11, I found this handy table that translates these terms into degrees fahrenheit. 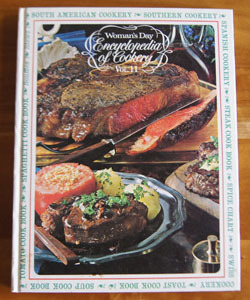 Cookbook #217: Crockery Cookery, Mable Hoffman, H. P. Books, Los Angeles, CA, 1975. I just now realized: This paperback book has the same title and cover photo and publication date as my hardcover book Crockery Cookery. 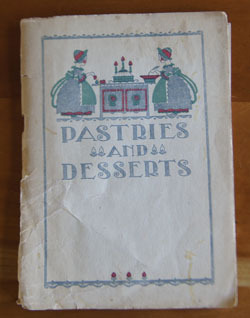 This paperback is from my own collection, while the hard back version was my mother’s. 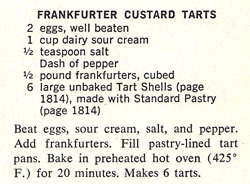 I didn’t mark or note any of the recipes in the paperback. 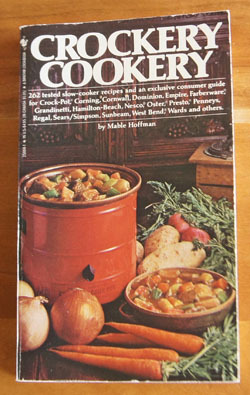 The information on the use of different brands of crockpots is the same in both, but some of the recipes are different. And, the hardcover edition is better illustrated. In all, I have eleven crockpot cookbooks in my database. See my first crockpot blog entry for a little on the history of crockpots. 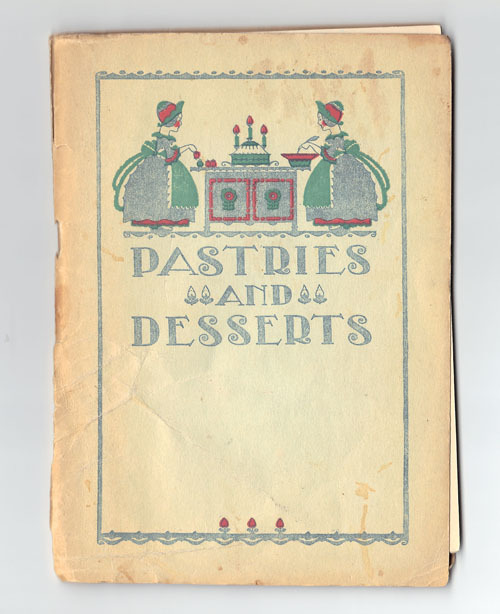 Before I realized that this cookbook was a duplicate, I spent some time poring over the recipes. 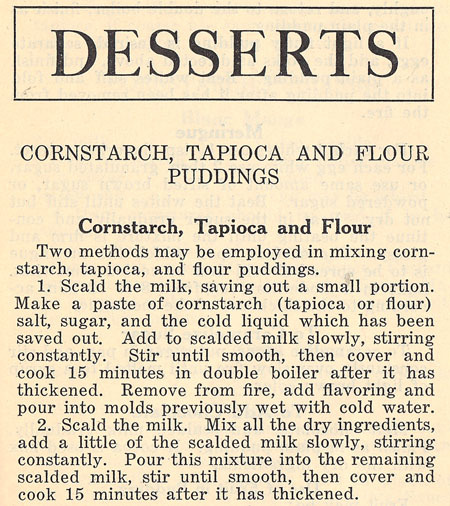 This time they struck me as “definitely severnties” in content. For better or worse! 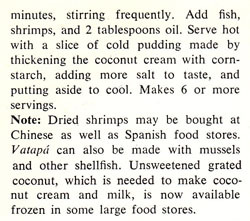 To me, seventies style foods can be both comfort foods and over-fatty over-packaged over-salted foods to avoid. Today I will take them as comfort foods. 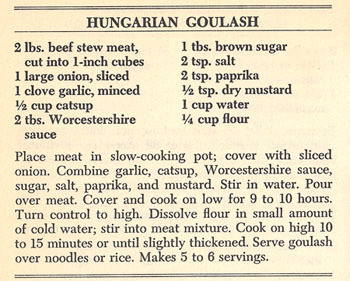 I choose to make “Hungarian Goulash”, with ketchup, Worcestershire sauce, brown sugar, mustard, paprika, and garlic and onion. The recipe calls for beef stew meat, but I have a quantity of pork loin in the freezer so I decide to use that instead of beef. Put the meat in a crockpot and then add the onion. In a bowl or measuring cup, combine the garlic, ketchup, Worcestershire sauce, sugar, salt, paprika, mustard, and 1 cup water. Stir to combine,then pour over the meat/onion mix in the crockpot. 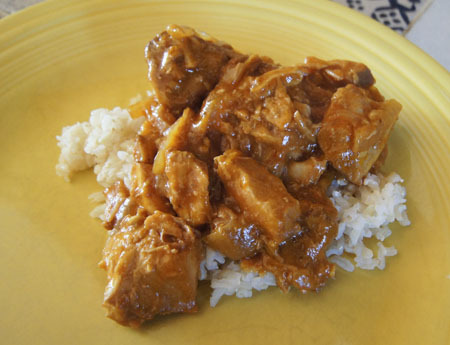 Cover and cook on low from 9-10 hours, or on high for 4-5 hours, until the meat is very tender. 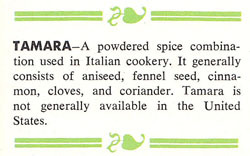 Taste and add salt and pepper to your taste. Then, with the crockpot on high, add the 1/4 cup flour mixed with a small amount of water. Stir in, then cover and cook on high for 15 minutes, until the sauce is thickened. This was very good. I’d make it again! I am going to recycle this paperback, though. The hardcover version is more pleasant to use, largely because of the color photographs. 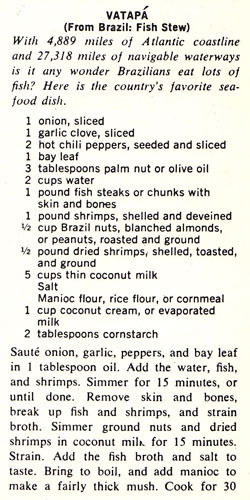 Cookbook #216: Handbook of the Nutritional Contents of Foods, prepared by Bernice K. Watt and Annabel L. Merrill for the United States Department of Agriculture, Dover Publications, Inc., NY, 1975. 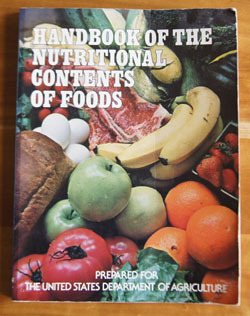 I bought the Handbook of the Nutritional Contents of Foods for myself new or used, I think sometime in the eighties. Around that time, I was developing a basic “eating plan” for myself, or maybe I should say “dieting plan”. You see, for years, I would diet strictly for months, eat sensibly for a short time, overindulge for weeks, then repeat the cycle. 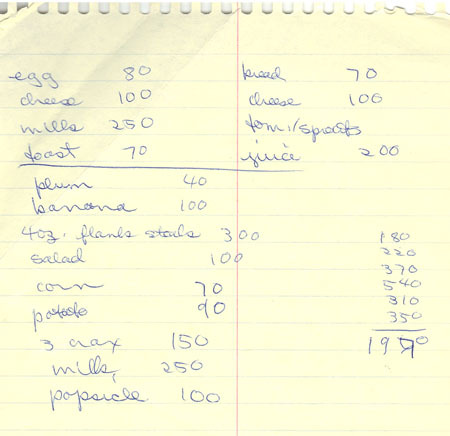 I drew up my first plan based on a diet given to me in the early seventies, before I left California. 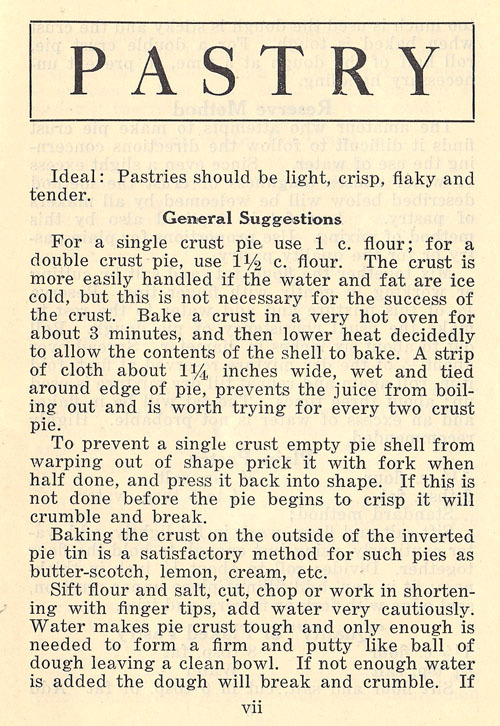 Later, The Calculating Cook influenced my diet plan, as well as The Glucose Revolution Pocket Guide to Losing Weight. Those books taught me how to judge food choices as good sources of protein and good or bad carbohydrates. Handbook of the Nutritional Contents of Foods gets down to the dark and dirty of the calories and nutrients in thousands of foods. I went through a period of counting calories. And I don’t mean simply “counting calories”. I wrote down exactly what I ate each day and calculated the number of calories in each portion of food. 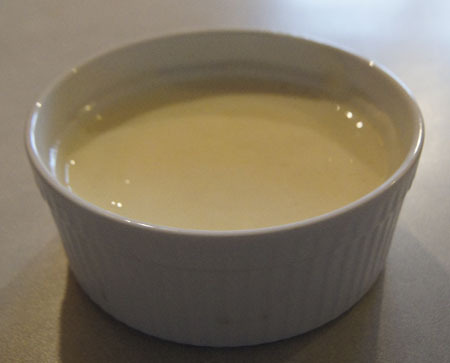 At first, I measured portions with measuring cups; later I used a kitchen scale. When I discovered computer databases in the late eighties, I went crazy. I kept computer records of everything I ate, calculated the numbers of calories per day, and correlated it with my weight. I even graphed results. And, I rarely ate out when in a strict dieting phase because it could add an unknown number of calories. This continued for a long time and the Handbook of the Nutritional Contents of Foods was my ultimate resource for years. 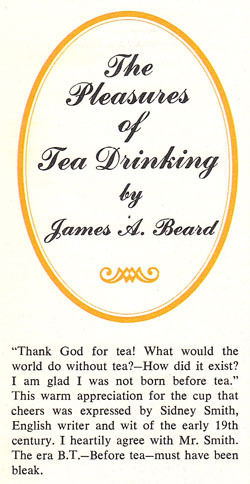 This is a very serious, scientific type book that appeals to my scientific nature. More than just calories, I studied my diet to make sure I was getting enough of the nutrients considered essential. I found a page tucked into this book where I listed vitamins and good sources of each. 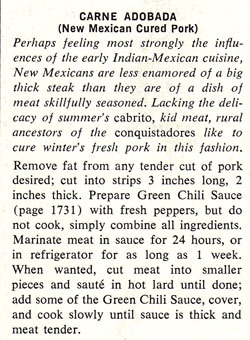 One thing I recall about looking up calories in this book is that it was difficult to find the calories in meats. I think maybe it was because I didn’t have a kitchen scale at the time, and would have to estimate the calories from the meat package label, using the amount sold (raw) and estimating the size of the portion I cut for myself. Am I counting calories today? No! Life and food are too much fun, and I want to enjoy both. But, I do know to limit portions and usually do so. 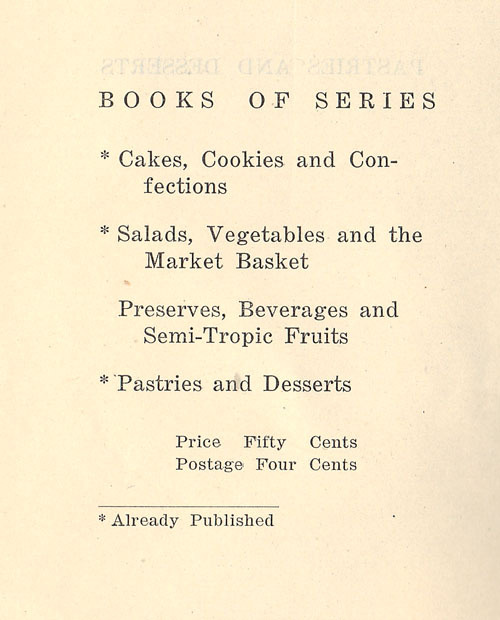 Handbook of the Nutritional Contents of Foods is a large book (8 3/4 x 12 inches) of 190 pages. 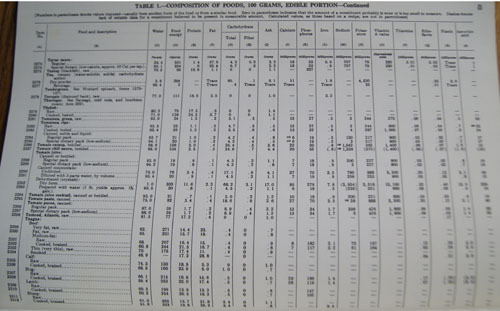 It is almost only tables, as described below. Table 3: Selected Fatty Acids in Foods. Useful if you are carefully watching your saturated and unsaturated fatty acid intake. 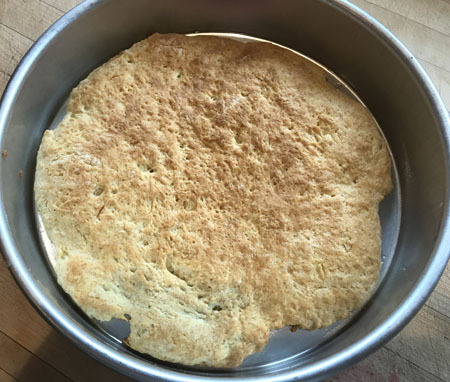 Cooking olis are listed, but the focus is on the food product, be it a fish, meat, dairy product, vegetable, fruit, or bread product. Table 4: Cholesterol Content of Foods. One page only. Table 5: Magnesium Content of Food. Ten pages. 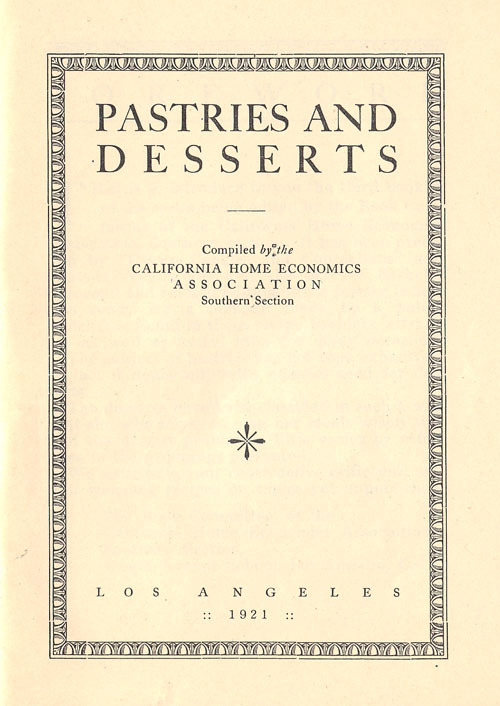 The final pages are notes, small tables of miscellaneous values, explanations of where the values for the book were found, and a bibliography. Will I keep this book? Yes, but mostly for curiousity. 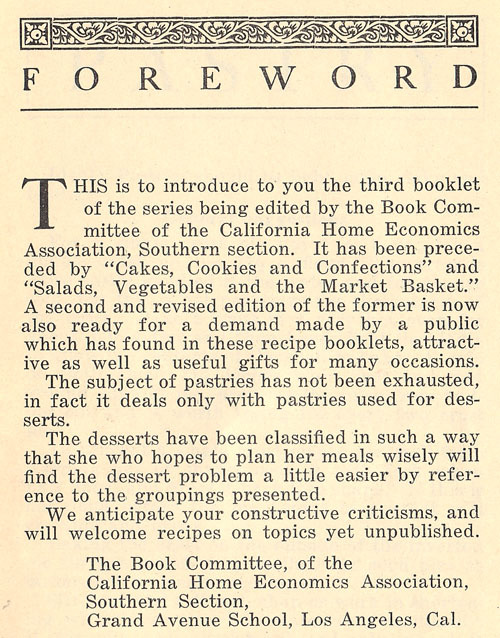 The book is over forty years old, after all. And of course, the values are so, so much easier to look up online. I have a few favorite go-to sites for food values, but basically, all you have to do is type the name of a food into a search engine and the food value will pop up. And what shall I cook for this blog? 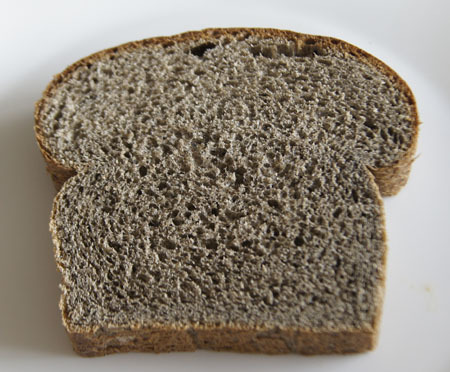 As a comparison, I look up the values for all purpose white flour: 364 cal, 10.5 protein, 1.0 g fat, 76.1 g carbohydrate, .43 g ash, 16 calcium, 87 phosphorus, .8 iron, 2 sodium, 95 potassium, 0 A, .06 thiamine, .05 riboflavin, .9 niacin, 0 vitamin C.
I sniffed the loaf like I always do. Pee-yoo, it stinks! Something about the smell really turns me away. I ate a big bite and it tasted like it smelled. Yuck. I was able to eat a slice with a lot of Whole Foods peanut butter and my own homemade Colorado apricot jam. It was very filling and left me with no lingering stinky after effects. 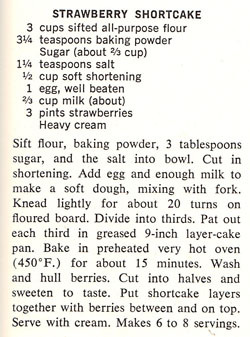 But buckwheat is not for me.